USES: This medication is used to treat depression. It is also used with other therapies for the treatment of nighttime bed-wetting (enuresis) in children. Using this medication to treat depression may improve your mood, sleep, appetite, and energy level and may help restore your interest in daily living. Imipramine can help your child control nighttime bed-wetting. 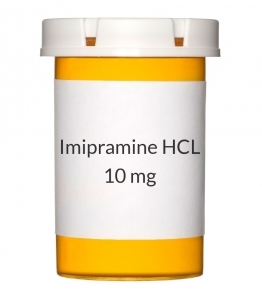 Imipramine belongs to a class of medications called tricyclic antidepressants. It works by restoring the balance of certain natural substances (neurotransmitters such as norepinephrine) in the brain. For bed-wetting, this medication may work by blocking the effect of a certain natural substance (acetylcholine) on the bladder. OTHER USES: This section contains uses of this drug that are not listed in the approved professional labeling for the drug but that may be prescribed by your health care professional. Use this drug for a condition that is listed in this section only if it has been so prescribed by your health care professional. This drug may also be used for the treatment of anxiety, panic disorders, and certain types of ongoing pain. HOW TO USE: Read the Medication Guide available from your pharmacist. Consult your doctor or pharmacist if you have any questions. Take this medication by mouth with or without food, usually 1-4 times daily or as directed by your doctor. If you have daytime drowsiness, your doctor may direct you to take the entire dose once daily at bedtime. Dosage is based on your medical condition and response to therapy. In children, dosage may also be based on body weight. To reduce your risk of side effects, your doctor may start you at a low dose and gradually increase your dose. When used in children for bed-wetting, imipramine should be taken one hour before bedtime. If your child usually wets the bed early in the night, the drug may be given earlier in separate doses (e.g., one dose in the afternoon and one dose at bedtime). Follow your doctor's instructions carefully. Do not take more or less medication or take it more frequently than prescribed. Your condition will not improve any faster and your risk of side effects will increase. Use this medication regularly in order to get the most benefit from it. To help you remember, use it at the same time(s) each day. This medication does not work right away. It may take up to 3 weeks before you experience the full benefits if you are taking this medication for depression. It is important to continue taking this medication even if you feel well. Do not suddenly stop taking this medication without consulting your doctor. Some conditions may become worse when the drug is abruptly stopped. Your dose may need to be gradually decreased. When used for an extended period in children for bed-wetting, this medication may not work as well and may require different dosing. Talk with the doctor if this medication stops working well. Inform your doctor if your condition persists or worsens. SIDE EFFECTS: Dry mouth, blurred vision, headache, drowsiness, dizziness, constipation, nausea, vomiting, loss of appetite, diarrhea, stomach cramps, weight gain/loss, and increased sweating may occur. If any of these effects persist or worsen, notify your doctor or pharmacist promptly. Remember that your doctor has prescribed this medication because he or she has judged that the benefit to you is greater than the risk of side effects. Many people using this medication do not have serious side effects. Tell your doctor immediately if any of these unlikely but serious side effects occur: mental/mood changes (e.g., confusion, depression, hallucinations, memory problems), enlarged/painful breasts, unusual breast milk production, irregular/painful menstrual periods, muscle stiffness/twitching, restlessness, ringing in the ears, sexual problems (e.g., decreased sexual ability, changes in desire), shakiness (tremors), numbness/tingling of the hands/feet, pain/redness/swelling of arms or legs, trouble urinating, severe vomiting. Tell your doctor immediately if any of these rare but very serious side effects occur: easy bruising/bleeding, signs of infection (e.g., fever, persistent sore throat), severe stomach/abdominal pain, dark urine, yellowing of eyes/skin. Seek immediate medical attention if any of these rare but very serious side effects occur: chest pain, slow/fast/irregular heartbeat, fainting, seizures, slurred speech, weakness on one side of the body, vision changes. A very serious allergic reaction to this drug is unlikely, but seek immediate medical attention if it occurs. Symptoms of a serious allergic reaction include: rash, itching/swelling (especially of the face/tongue/throat), severe dizziness, trouble breathing. This is not a complete list of possible side effects. If you notice other effects not listed above, contact your doctor or pharmacist. In the US - Call your doctor for medical advice about side effects. You may report side effects to FDA at 1-800-FDA-1088. In Canada - Call your doctor for medical advice about side effects. You may report side effects to Health Canada at 1-866-234-2345. PRECAUTIONS: Before taking this medication, tell your doctor or pharmacist if you are allergic to it; or to other tricyclic antidepressants (e.g., amitriptyline); or if you have any other allergies. This product may contain inactive ingredients, which can cause allergic reactions or other problems. Talk to your pharmacist for more details. This medication should not be used if you have a certain medical condition. Before using this medicine, consult your doctor or pharmacist if you have had: a recent heart attack. Before using this medication, tell your doctor or pharmacist your medical history, especially of: breathing problems (e.g., asthma, chronic bronchitis), certain eye problems (e.g., glaucoma, increased intraocular pressure), diabetes, eating disorders (e.g., bulimia), heart problems (e.g., arrhythmias, coronary artery disease), liver problems, kidney problems, personal or family history of other mental/mood conditions (e.g., bipolar disorder, schizophrenia), seizures, overactive thyroid (hyperthyroidism), trouble urinating (e.g., due to enlarged prostate), any condition that may increase your risk of seizures (e.g., alcohol/sedative dependency, use of electroconvulsive therapy, brain injury/disease such as stroke), certain types of tumors (e.g., pheochromocytoma, neuroblastoma). Imipramine may cause a condition that affects the heart rhythm (QT prolongation). QT prolongation can infrequently result in serious (rarely fatal) fast/irregular heartbeat and other symptoms (such as severe dizziness, fainting) that require immediate medical attention. The risk of QT prolongation may be increased if you have certain medical conditions or are taking other drugs that may affect the heart rhythm (see also Drug Interactions section). Before using imipramine, tell your doctor or pharmacist if you have any of the following conditions: certain heart problems (heart failure, slow heartbeat, QT prolongation in the EKG), family history of certain heart problems (QT prolongation in the EKG, sudden cardiac death). Low levels of potassium or magnesium in the blood may also increase your risk of QT prolongation. This risk may increase if you use certain drugs (such as diuretics/"water pills") or if you have conditions such as severe sweating, diarrhea, or vomiting. Talk to your doctor about using imipramine safely. Before having surgery, tell your doctor or dentist that you are taking this medication. This drug may make you dizzy or drowsy or cause blurred vision. Do not drive, use machinery, or do any activity that requires alertness or clear vision until you are sure you can perform such activities safely. Limit alcoholic beverages. To decrease dizziness and lightheadedness, get up slowly when rising from a seated or lying position. This drug may make you more sensitive to the sun. Avoid prolonged sun exposure, tanning booths, and sunlamps. Use a sunscreen and wear protective clothing when outdoors. If you have diabetes, this drug may make it harder to control your blood sugar levels. Check your blood sugar regularly as directed by your doctor. Tell your doctor immediately if you have symptoms such as increased thirst/urination, shakiness, unusual sweating, or hunger. Your anti-diabetic medication or diet may need to be adjusted. Caution is advised when using this drug in the elderly because they may be more sensitive to the side effects of the drug, especially effects on the heart and mental/mood changes (e.g., confusion, agitation). Caution is advised when using this drug in children. (See also the Warning section.) This medication should be used only when clearly needed during pregnancy. Infants born to mothers who have taken similar medications during pregnancy may have symptoms such as trouble urinating, prolonged sleepiness, shaking, and seizures. Discuss the risks and benefits with your doctor. This medication passes into breast milk and may have undesirable effects on a nursing infant. Consult your doctor before breast-feeding. DRUG INTERACTIONS: Your healthcare professionals (e.g., doctor or pharmacist) may already be aware of any possible drug interactions and may be monitoring you for it. Do not start, stop or change the dosage of any medicine before checking with them first. This drug should not be used with the following medications because very serious, possibly fatal interactions may occur: arbutamine, disopyramide, sibutramine, MAO inhibitors (isocarboxazid, linezolid, methylene blue, moclobemide, phenelzine, procarbazine, rasagiline, selegiline, tranylcypromine). Avoid taking MAO inhibitors within 2 weeks before, during, and after treatment with this medication. In some cases a serious, possibly fatal drug interaction may occur. If you are currently using any of these medications listed above, tell your doctor or pharmacist before starting imipramine. Before using this medication, tell your doctor or pharmacist of all prescription and nonprescription/herbal products you may use, especially of: anticholinergics (e.g., atropine, belladonna alkaloids, scopolamine, drugs for Parkinson's disease such as benztropine), inhaled bronchodilators (e.g., albuterol, salmeterol), certain drugs for high blood pressure (e.g., clonidine, guanadrel, guanethidine, reserpine), digoxin, nasal decongestants (e.g., epinephrine, phenylephrine), levodopa, lithium, stimulants (e.g., amphetamine, epinephrine, methylphenidate), thyroid supplements, valproic acid, drugs affecting liver enzymes that remove imipramine from your body (e.g., alcohol, barbiturates such as phenobarbital, cimetidine, cisapride, haloperidol, certain drugs for heart rhythm such as flecainide/propafenone, halofantrine, certain HIV protease inhibitors such as amprenavir/fosprenavir, phenothiazines such as thioridazine, pimozide, certain anti-seizure drugs such as carbamazepine/phenytoin, antidepressants such as citalopram/fluoxetine/fluvoxamine/paroxetine/trazodone, St. John's wort, terbinafine). Many drugs besides imipramine may affect the heart rhythm (QT prolongation), including amiodarone, dofetilide, pimozide, procainamide, quinidine, sotalol, macrolide antibiotics (such as erythromycin), sparfloxacin, among others. Therefore, before using imipramine, report all medications you are currently using to your doctor or pharmacist. Also report the use of drugs which might increase seizure risk (decrease seizure threshold) when combined with this medication such as bupropion, isoniazid (INH), theophylline, or tramadol, among others. Consult your doctor or pharmacist for details. Tell your doctor or pharmacist if you also take drugs that cause drowsiness such as: certain antihistamines (e.g., diphenhydramine), anti-anxiety drugs (e.g., diazepam), anti-seizure drugs (e.g., levetiracetam), drugs for motion sickness (e.g., meclizine). Check the labels on all your medicines (e.g., cough-and-cold products) because they may contain drowsiness-containing ingredients or decongestants that could increase your heart rate or blood pressure. Ask your pharmacist about the safe use of those products. Cigarette smoking decreases blood levels of this medication. Tell your doctor if you smoke or if you have recently stopped smoking. This document does not contain all possible interactions. Therefore, before using this product, tell your doctor or pharmacist of all the products you use. Keep a list of all your medications with you, and share the list with your doctor and pharmacist. NOTES: Do not share this medication with others. Laboratory and/or medical tests (e.g., blood counts, EKG, kidney function) may be performed regularly to monitor your progress or check for side effects. Consult your doctor for more details. Keep all medical appointments. STORAGE: Store the US product in a tightly closed container at room temperature between 68-77 degrees F (20-25 degrees C) away from light and moisture. Store the Canadian product in a tightly closed container at room temperature between 35.6-86 degrees F (2-30 degrees C) away from light and moisture. Do not store in the bathroom. Keep all medicines away from children and pets. Do not flush medications down the toilet or pour them into a drain unless instructed to do so. Properly discard this product when it is expired or no longer needed. Consult your pharmacist or local waste disposal company for more details about how to safely discard your product.